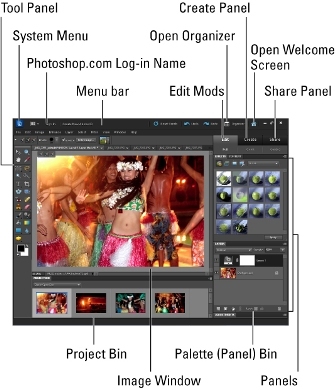 Photoshop Elements has two separate components: the Organizer and the Full Photo Edit mode. Manage photos in the Organizer. In Full Photo Edit mode, correct brightness and color in photographs, add effects, and repair photos. After starting Photoshop Elements, choose the Organizer or Full Photo Edit mode. Open an image in the Elements Full Photo Edit mode. Choose File→Open. more details regarding your document. Easily switch between open documents. Click images in the Project Bin. Access panels. Choose them from the Window menu or the Panels Bin.